If we were to choose one Biblical author and one verse to be queried by a time-traveling exegete, Paul’s insistence to the Corinthians that “all who eat and drink without discerning the body, eat and drink judgment against themselves” (I Corinthians 11:29) would get more than a few votes. The judgment is clear–in the next verse, Paul explains that the Corinthians are taking ill and dying because of this particular impiety–but the precise sense of “discerning the body” has bedeviled the church for a very long time. Does it refer to discerning what a later age would call the real presence of the Body and Blood of Christ? Does it refer to identifying the body of believers among whom one partakes? Is it aimed instead toward personal holiness? 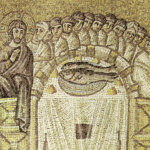 In this issue of Let’s Talk, we’re exploring how the church discerns the sacramental body against a shifting background of the world at large–a world of Christians from various traditions, of confirmed skeptics and curious “nones,” of religious seekers and the committed adherents of other faiths. New questions are being asked, in and of this body, about what constitutes participation, sharing, commitment, and membership. Should the traditional restriction of holy communion to the baptized believers be sustained in a world of more permeable identities and practices? Can participation in worship and community be entirely “virtual”? What does “membership” mean in an age of ephemeral, if significant, affiliations? From the vantage point of a parish in a young, geographically and philosophically mobile community, Craig Mueller asks what it means to invite people into church membership. The idea of church membership itself being developed in and suited to a very different milieu, Mueller wonders: “Is it possible to be a public church that welcomes people at whatever level of commitment they find themselves, while encouraging others to become more involved in the life and mission of the community?” To do both well and faithfully will be a challenge for more and more religious communities as affiliations with organized religion continue to loosen. Finally Tim Brown addresses the rising question of whether community participation can become largely, or even fully, virtual and electronic. “Even Facetime or Skype aren’t like sitting in the same room,” Brown cautions, “where you both have to pause as the same siren goes past, smell the same stale air blow through a bad ventilation system, or negotiate a small shared table.” Modern communication methods, stunning as they are, introduce one kind of distance while diminishing others. Each of these articles is offered to encourage your own thoughts and discernment on how Christian community is discerned, formed, and experienced. How do you invite people to share in holy communion? How do you communicate with people on the fringes of the church, or outside of it entirely? How do virtual and real presence interact in your experience? Drop us a line and continue the conversation! 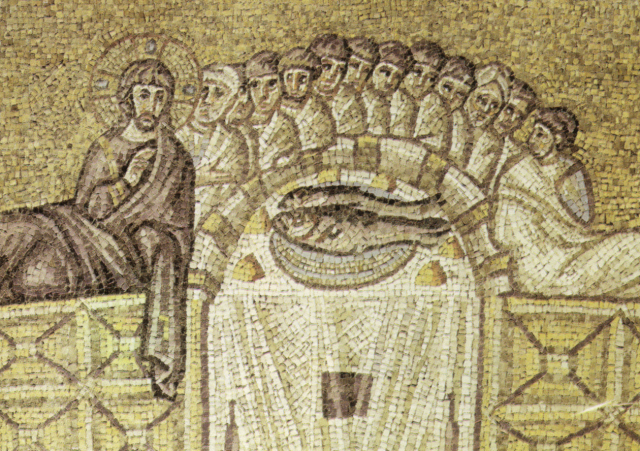 “Ravenna, sant’apollinare nuovo ultima cena (inizio del VI secolo)“. Licensed under Public domain via Wikimedia Commons.